right too much grip. It shows up as understeer or push and it happens more often than you think. On the regional and national level, it happens quite often and even at the club level, when there are a lot of karts on the track and the conditions are right, you can have more grip than you know what to do with. Dealing with it is not as simple at you might think, but I will try to give you some pointers to help free it up. First, this situation is somewhat inherent to the design of karts. 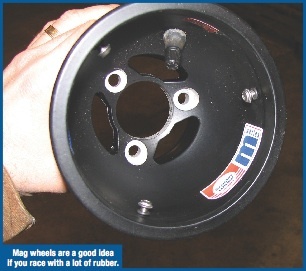 Most of all it stems from the solid rear axle which defines a racing kart. 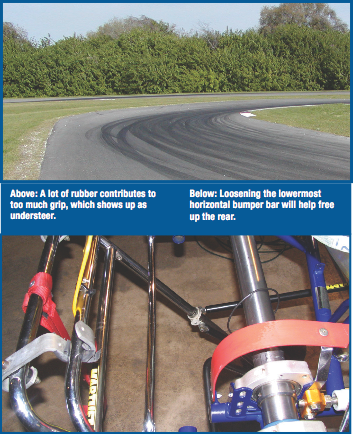 In order to make a kart turn you need to unload the inside rear tire so the front tires can steer the kart. 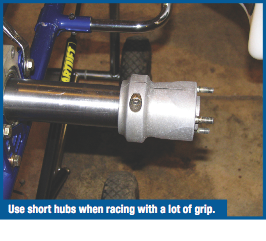 If you don’t unload that inside rear tire the 2 rear tires that are linked together with the axle simply overpower the fronts and push the kart forward. This is the fundamental story of a kart. It inherently has a tendency to understeer. The more grip you have the more the tendency is. So what do you do without it? You need to find ways to unload that inside rear tire. Of course like everything there are multiple ways to do that. Since the problem originates at the rear I recommend to start there first. These are the things I would try in order of severity. That is, the first on the list is the smallest change and the last is the biggest change. You will need to choose what is best for your kart by doing some experimenting. 1. Loosen the rear horizontal bar at the rear bumper. Don’t remove it as that would be against the safety rules, but simply loosen the nuts holding it on so that you can wiggle it a bit. This will reduce the stiffness of the rear frame and allow the rear to flex more helping that inside rear tire to unload more. 2. 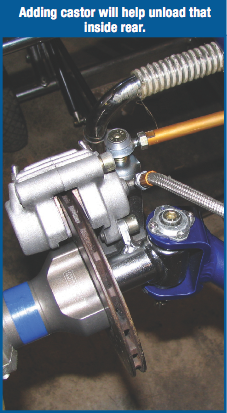 Remove the rear torsion bar and side bar if installed. Again same as #1 we are trying to get more flex in the rear of the kart. 3. Widen the rear track out as much as possible. This change will reduce the amount of weight on the inside rear tire giving it a better chance of unloading. 4. Change to shorter rear hubs. The idea here is to allow the rear of the chassis to flex more. The axle is part of the stiffness of the frame and the longer wheel hubs just add to the stiffness of the axle. Putting shorter hubs on will allow the axle to flex more. 5. Unbolt the 3rd bearing. The idea is to again allow the rear of the kart to flex more. By loosening the 3rd bearing support you take the inside frame rail out of the equation and the chassis will flex more. When you do this you don’t need to remove the bolts completely. Just loosen the nuts and bolts until the cassette can wiggle relative to the bearing hanger. If your kart design does not have bolts that go through the cassette with nylon locknuts you can use zip ties to hold the cassette in place. Note: Be very careful when doing this one. The axle will flex more and the possibility of popping a chain becomes greater. Chain adjustment may be necessary. Also you need to make sure you secure the cassette parts. You don’t want the cassette to spin and get caught in something. 6. Finally change to a softer axle. This is the most drastic change and one of the most difficult to do quickly at the track. After some experience with a lot of grip, you might consider doing this one first. It is easier to add more grip to the kart than take it away. What happens if you have made all of those changes and you still can’t seem to get the kart to turn? If you still can’t get the kart freed up, work on the front. When working on the front you are still trying to free up the rear, but you do it in the opposite way you did in the rear. In the front you will need to add grip. Adding grip in the front to an under steering kart will give the front tires a better chance of steering those 2 big rear tires. Again like the previous list these are listed in order of smallest to biggest effect. 1. Add front torsion bar. Unlike in the rear when we were trying to add flex and therefore decrease grip here we are doing the opposite. By adding the front bar we increase stiffness to the frame, decreasing the front end flex and therefore make the castor that is designed into the frame more effective. This will cause more weight to be transferred off of that inside rear tire helping it to slip. 2. Increase front track. Again the game here is to increase front grip. Increasing front track will make the front end more sensitive to the castor designed into your frame giving the front end more leverage to unload the rear inside tire. Be aware making this change will improve turn in performance but will decrease mid corner grip. This is because moving the tires are further away from the center of the chassis there is less weight on those tires in a turn. 3. Increase castor. This is the most effective way to add grip to the front end. 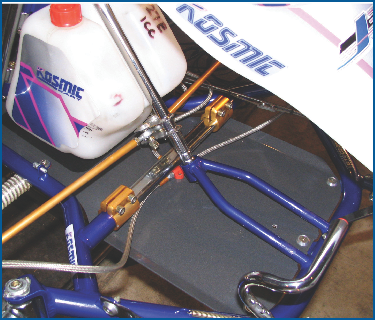 Adding castor will increase the front ends ability to lift that inside rear tire and therefore allow the kart to turn. Of course the negative here is that steering effort will go up causing arm fatigue. Finally one of the most effective ways to reduce grip when there is a lot of rubber is to decrease tire pressure. Lower tire pressure will allow the tire to run cooler and therefore will have less grip. Be careful not to reduce tires below the tire manufacturers’ recommendations. Too low a pressure will be a safety concern potentially resulting in de-beading a tire. Of course with all of the changes listed you might find a combination that your kart will not respond favorably to. The response usually shows up as a bad mid corner hop. This still is happening because there is too much grip but the hop occurs because the frame is flexing a lot because the tires have so much power and won’t release from the track. The frame winds up and snaps back into shape resulting in a hop. Common ways to fix this is to change the frame stiffness is some way. Sometimes adding or removing a torsion bar helps get rid of the hop, usually removing helps more often than not though. You also might try to remove seat struts, but in my experience this isn’t always effective. Now you know what changes to make to the chassis to free it up when you are dealing with a lot of rubber. A lot can be done to help the kart get around the corners. Smoothness is key to going fast when there is a great deal of rubber. The more abrupt you are with the controls, the more likely the chassis will hop and bind up. Be smooth with the accelerator pedal, brakes and steering. Try changing your driving line. You will likely find that moving your line just a few inches closer to the center of the turn or farther away will help free the kart up. Finally try a bit more trail braking entering the turn. Carrying the brake into the corner while you turn the steering will be asking the rear tires to both turn and slow the kart. If you have too much grip, in the beginning, this will be asking the rear tire to do too much work causing them to slide helping you to turn. Of course trail braking is quite an advanced technique and requires considerable practice to get it right. During one of your normal testing days you might want to consider spending time learning the skill. It could come in handy someday. So on that really sticky summer day at the track when the rubber is so thick that you can’t get the kart around the corner do the following. Remove as much grip from the rear as you can and then if that is not enough add grip to the front. Be smooth and use that trail braking skill you have been working on. With a little bit of practice and these simple guidelines, you might end up in the winner’s circle.